Netflix prices to rise across all three streaming tiers | What Hi-Fi? Netflix is raising its US prices by between 13 and 18 per cent, the company's biggest price hike since the launch of its streaming service in 2007. All three of the streaming packages will go up in price, with the Basic package jumping from $8 to $9, the Standard (HD) package increasing from $11 to $13 and the Premium (4K) package going up from $14 to $16. The new prices will affect new customers immediately and roll out to existing subscribers over the next three months. There's no word on UK or European price changes as yet. 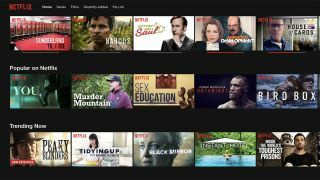 It's the first time the cheapest plan has been increased, with Netflix previously only raising the cost of the higher-quality video plans. In a statement, Netflix said the increase in price was required to fund new content and the interface: "We change pricing from time to time as we continue investing in great entertainment and improving the overall Netflix experience." The news comes two days before the company announces it Q4 earnings - and sent shares up 6%.